The festival was billed as a benefit for La Cocina, which provides a community kitchen and advice to help locals start food-related businesses. During the lunch hour on Mission, you can still find a delicious bacon-wrapped hot dog -- but they're now served by Antojitos San Miguel, a licensed trailer operated by Taquería San Miguel, a restaurant further down the street. Smaller vendors have been chased off the sidewalk by local authorities for operating without licenses, and even accused of having a role in the local drug trade. 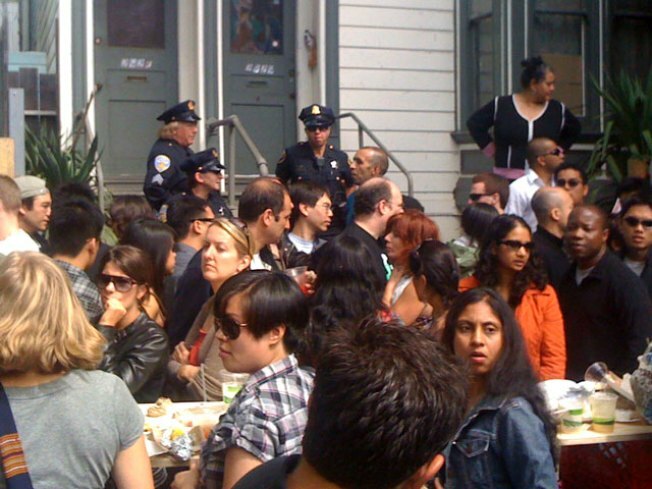 All of which lead to layers of irony in the events surrounding the San Francisco Street Food Festival last weekend. The festival was billed as a benefit for La Cocina, which provides a community kitchen and advice to help locals start food-related businesses, specifically intended to help make permitting vendors easier. And on hand to support the cause were a number of restaurants, including Pizzeria Delfina and Absinthe -- even though the maze of local regulations has been accused of being essentially a protection racket that benefits vendors with a fixed address. The event was so popular, people waited as long as an hour in line for bite-sized snacks -- someone defeating the purpose of a cuisine with the primary appeal of convenience. And to add insult to irony, Don't Forget Your Lunch showed up at the fest only to be temporarily detained and threatened with fines by police (though it didn't stop the hungry crowd from eating up the entire inventory). Other uninvited vendors were luckier, and the city may be taking steps to ease regulations, but for outlaw desert artists like the Creme Brulée Guy, it may be best to keep things anonymous and under the radar. Jackson West relishes the discussion of race, class and economics that has ensued amidst the street food boom.